After spending so long waiting for our rivers to recover from the last torrential rain event East Australian fisherman are now forced to fish in the dirty water again. For many just simply seeing the brown water can be enough of a turn off to allow your rods and reels to gather cobwebs. Fortunately there are still options available to even the average fisho despite the dirty water. Large rivers such as the Clarence that flows through Grafton, Maclean and Yamba on the NSW North Coast feature extremely strong flows during and after floods. Recently this river had its largest flood on record and as a result only the keenest of fisherman are even considering fishing it. The locations you can fish are limited and structure that you used to fish will be gone, moved to a new location or obliterated completely. But in the Clarence as with the Richmond, Bellinger, Hastings, Tweed, Logan, Jumpinpin, Brisbane and all other decent sized East Australian flood affected systems, there is one thing you can do that you couldn’t do before. 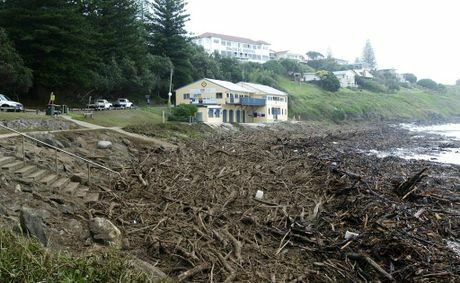 After floods you find that there is a discernible dirty plume of water that flows out into the clean water of the ocean. At first this plume can push extremely far out into the ocean, sometimes for nautical miles. When the water slows down and the plume is a bit closer to the mouth of the river, it’s time to target the flood jew. All of these rivers are known to produce good sized jew at most times but during this event the real monsters of the deep that generally lurk the reefs as the apex predators come in to target the fish fleeing the low oxygen flood water for the salt. Other fish such as tailor and tuna will also join in on this action so you can find yourself with a very hot bite if you time it right. After a significant rain event at the beginning of 2012, there was a confirmed capture of a 47.5kg jewfish in the Shoalhaven River on the South Coast of NSW. The technique is pretty simple. Simply set yourself up in the clean, salty water within casting distance of the dirty water. Throw a baitfish pattern lure into the brown water and imitate a fish fleeing into the salt. Metals are good for this when targeting tailor, tuna and salmon but heavily weighted plastics are the go for jewfish. Either way you need heavy lures to get down into the deeper water with the fast flowing current. 47.5kg Shoalhaven stonker caught by Vaughan Little. As for inside the river itself, it will be largely a write off for a month or two except for on two main counts. Extremely deep holes will still have saltwater in their depths because saltwater is denser than fresh. Fish will be holding to these pockets of salt in huge numbers so if you are fortunate enough to find one of these fish traps you will be laughing. Anything more than around 10 feet deep will still be relatively salty and the crabbing is usally pretty darn good after a flood, as the usually lethargic creatures get really active without their usual predators on the hunt. The rock fishing is a write off for quite a few weeks after a significant flood. All of the creatures that live among the rocks that hold the fish to the structure will have been swept away and all of the flora gone too. But as the system recovers these creatures will return and the fishing will slowly return to normal, the beaches though are a different proposition. While some beaches will be completely shut down because of debris, the above is unusual in the extreme. Fortunately most beaches will naturally clean themselves up and once they are accessible you can get some of the best beach fishing post-flood. The extreme surges that are associated with the weather that cause floods can carve out some incredible gutters and as all beach fisherman know, that is where the fish are! The best part is that all the saltwater species that are escaping the brown water have to go somewhere and species like bream, whiting, flathead and tailor are remiss to head to deep water, so here is where you will find them.